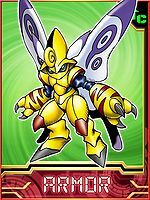 An Armor-level Insect Digimon that evolved through the power of the "Digimental of Knowledge". 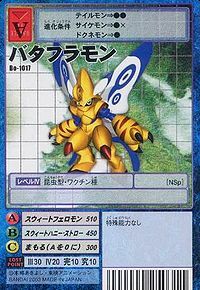 Like Flybeemon and Honeybeemon, it is a mythical Digimon that was born due to the power of the Digimental during a large Kunemon outbreak. It prefers living in meadowy areas with a warm climate. It hates conflict and has a friendly personality. 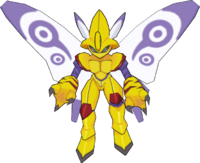 As its Special Move "Sweet Pheromone" is a technique for protecting itself in case it has no other option, it causes phosphorus powder containing a hallucinogenic program stored in its wings to rain down on the opponent and confuse them. This hallucinogenic program also has the effect of alleviating the opposing Digimon's hostility and is capable of ending the battle without injuring them. Sweet Pheromone  スウィートフェロモン Suwīto Feromon Wings send phosphorescent powder to confuse the foe. Honey Wave  ハニーウェーブ Hanīu Uēbu Emits a mysterious sound wave from the wings. Sweet Kick  スウィートキック Suwīto Kikku Attacks with a powerful flying kick. Sweet Honey Straw  スウィートハニー・ストロー Suwīto Hanī Sutorō Sends balls of light to absorb the target's health. Butterflamon is the partner of Yagami Hikari. 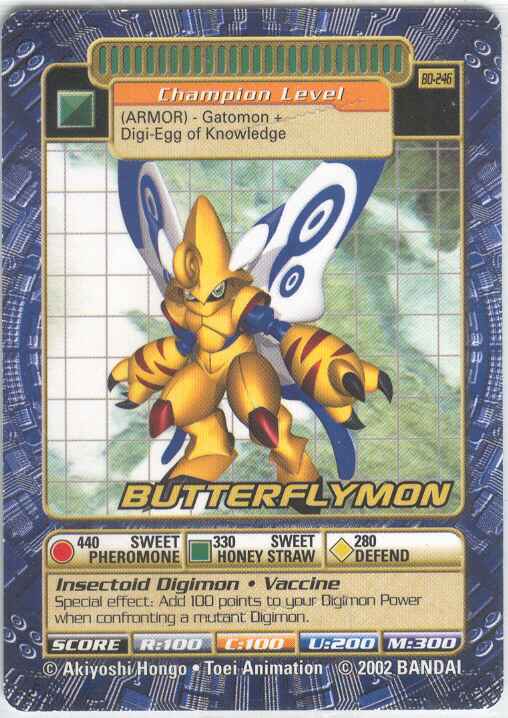 Butterflamon is only obtainable as a collectable card. 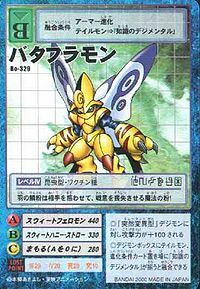 Its card is part of the Digimental of Knowledge (知識のデジメンタル Chishiki no Dejimentaru) set. 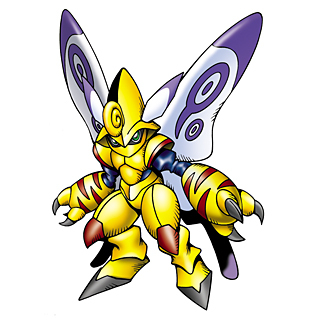 Butterflamon is available as a Digimon Medal. Butterflymon evolves from Tailmon using the Digimental of Knowledge. The scales from its wings form a magical powder, confusing its opponents and making them lose their will to fight!